Our embrace leads to praise. This is second part of Lent. We begin to feel the power of the Fourth Gospel. The “forces” that are opposed in the gospel have everything to do with the forces at work in my heart. He is clearly about to embrace his passage – his passover – from death to life. This paschal mystery is what we are preparing to celebrate. As we grow in love and compassion for what Jesus is facing for us, we ask to be prepared to embrace his way, his path, the pattern of his dying and rising. We ask that we would be prepared to proclaim this gift to others, with great joy “It was because Jesus did things such as this on the Sabbath that they began to persecute him.” For me. God the Father has given us his only Son, the Word made human, to be our food and our life. Let us thank him and pray: May the word of Christ dwell among us in all its richness. Help us this Lenten season to listen more frequently to your word, – that we may celebrate the solemnity of Easter with greater love for Christ, our paschal sacrifice. May your Holy Spirit be our teacher, – that we may encourage those in doubt and error to follow what is true and good. Enable us to enter more deeply into the mystery of your Anointed One, – that our lives may reveal him more effectively. Purify and renew your Church in this time of salvation, – that it may give an ever greater witness to you. 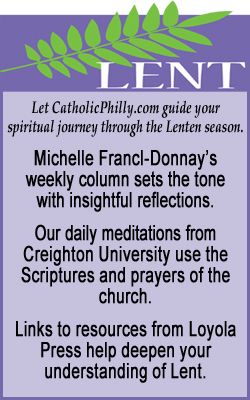 Joyful praise in Lent? I’m not sure I always feel that. 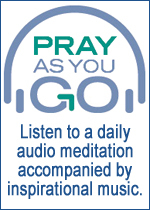 I ask you to help me prepare to understand and embrace the paschal mystery in my life. I don’t always see the beauty and mystery of this season and often I run from the pain. Help me to see how your saving grace and your loving touch in my life can fill me with joyful praise of the salvation you have sent to me.